DEVELOPMENT: Duo bets on sites despite risky ground game. That costly prospect scared away most potential buyers, but Matthew Winefield and Reid Breitman saw gold. The pair actively seek out such potentially toxic properties ― in this case a one-time gas station ― to fix up and flip. “We search aggressively for sites that have environmental distress, “ said Winefield, listing gas stations, dry cleaners, and metal factories as prospects. The Hollywood site, near the intersection of Sunset Boulevard and Western Avenue, is their latest project, and as with all properties that hold the risk of contamination, the turnaround will not be quick. Winefield and Breitman, who operate independent companies but partner regularly on cleanup projects, will have to wait a year or so while toxic vapors left from leaky underground petroleum tanks are sucked out of the site. And they’ll have to hold their breath waiting for a $1 million state grant to come through to foot the bill before they get started. The pair bought the site for $1 million and expect to be able to sell the remediated land for about $4 million. They don’t make deals contingent on getting a clean bill of health for the property, something they said sellers prefer. That kind of return keeps them in the market for such risky projects. Winefield said there are enough neglected sites around Southern California to keep them busy for at least the next decade, generating profits of at least 30 percent on a project. The key to success in this market comes with being OK with not exactly knowing what you’re going to find underground. Costs could quickly balloon by thousands or millions of dollars. Then there’s the chance of penalties from regulatory agencies or lawsuits from neighbors concerned about being sickened from soil and water polluted with toxic chemicals. The state’s Department of Toxic Substances Control has estimated that 90,000 properties throughout California, ranging from small businesses to landfills, are potentially polluted. In Los Angeles, 340 sites, mostly gas stations, have pending claims for financial assistance from the agency’s Underground Storage Tank Cleanup Fund. Criss Carrigan, director of enforcement at the California Water Resources Control Board, said he is beginning to see entrepreneurs, rather than big land owners, take on the gamble. 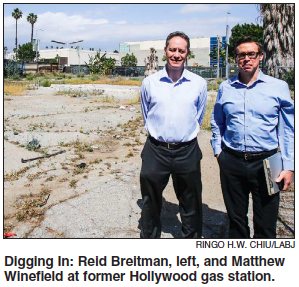 Winefield, 49, who lives in Long Beach, has been at this sort of work for more than 25 years, beginning his career by redeveloping brownfields for California’s oil industry. He later ran an engineering consultancy firm for 15 years, which led him to Pacific Palisades-based Breitman, also 49, around 2010. Breitman, an attorney, had long scouted for investment properties at tax sales and foreclosures. After the 2008 financial crisis, he bought 100 properties that had plummeted in value. Winefield helped Breitman rehab a few warehouses, and the two realized a common interest in rehabbing properties nobody else wanted. Winefield sold his engineering business, Alta Environmental, in 2013, and used the profits to go after more fixer-uppers with Breitman’s Hyperion Fund, an private equity firm that invests in distressed properties. To make the investment work, the partners have to ensure the cost of remediation is picked up by a third party, generally an insurance company or the government. Digging through documents and filing paperwork to figure out how to do that can take nearly a year and costs thousands of dollars. And not every project hits paydirt. Breitman said he once bought a former petroleum distribution facility expecting the cleanup cost to remain below $350,000. It ended up being twice that. Most of the cost was covered by state funding, but he still had to pay $125,000 more than he had planned. “I was still happy with the result, and there was still a substantial profit, but not as much as I had projected,” he said. Their first discovery together was a 40-year-old dry-cleaning shop in Garden Grove, where several accidents had leaked PCE, a chlorinated solvent, into the earth and downhill toward an elementary school. Winefield and Breitman hired insurance archaeologists to hunt down old general liability policies on behalf of the owner that would cover any sudden and accidental environmental damage from the past. They unearthed five policies from an insurer that would cover the $2.3 million cost of remediation and only then did they commit to paying less than $500,000 for the half-acre property. They are projecting that the “clean value” of the site should reach $2 million. The prior owners wouldn’t have been able to tackle such efforts, Breitman said. “They weren’t evil, they weren’t bad people, they just didn’t have the money to remediate the site. They were stuck,” he said. This method of profiting from old insurance policies will likely get harder. Insurers changed the wording of policies after the mid-1980s to exclude contamination cleanup responsibilities. Absent those policies, Breitman and Winefield will look to government funds to pay for cleanup efforts. The Hollywood property had been abandoned for about a decade, neglected after the owners, a family, ended its 40-year-run as a gas station. Eventually left to just one living family member who couldn’t afford remediation, the property sat untouched on the market for two years before Winefield and Breitman came along. They were not surprised that the owners had deferred cleanup. For a cost-effective remediation, Winefield and Breitman are depending on California’s Orphan Site Cleanup Fund, which can grant $1 million for an eligible site. That should provide for the soil vapor extraction process that will restore the land to safe use. Meanwhile, the partners are looking into securing an entitlement for the construction of a large commercial development, such as retail or apartments. Once it’s ready, they plan to sell it off or partner with a developer. The last thing he wants is for that funding to fall through. “We could spend $2 million or $3 million, and end up selling for a million. We do everything we can to prevent that,” he said.